Home / Life science / Slider / How Do Chameleons Change Color? 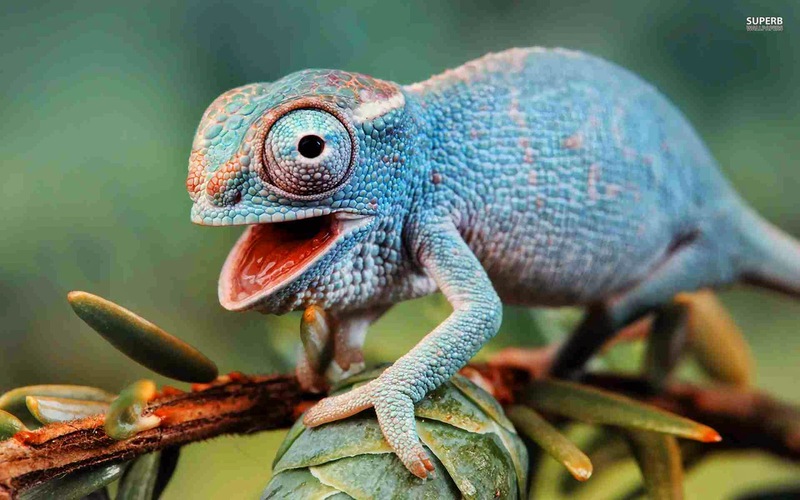 How Do Chameleons Change Color? scatter light or use a mechanism like thin-layer interference to amplify specific wavelengths to appear a particular colour. These chromatophores, iridophores in reptiles, can reflect different colours based on the different ultrastructural arrangment of organelles called reflecting platelets. In addition one mechanism of rapid colour change is to rapidly rearrange reflecting platelets within iridophores. Whether chromatophores are pigmented or producing colours structurally they seldom act in isolation. Different types of chromatophores are layered within the dermis in a fairly stereotypical organization. The colours of each chromatophore in the stack combine to determine the overall colour of the tissue. A well studied example of this is seen in the green skin of Anolis carolinensis. A yellow pigmented xanthophore covers a blue structurally coloured iridophore and both of these cells overlay a black pigmented melanophore. The yellow and the blue combine to an observed green colour that is intensified by the absorption of stray light by the underlying melanophore. Another common mechanism of rapid colour change in lizards is the rearrangement of pigmentary organelles so that they are in a different position within the overall chromatophore stack. The green of Anolis carolinensis can turn brown if the organelles contained within the melanophores move into a position where they overlay the yellow and blue of the xanthophores and iridophores respectively. Colours and colour change are used in quite complex ways both physiologically and ecologically. The three primary roles of tissue colour in reptiles are for thermoregulation, crypticity and signaling. Darker animals would absorb more solar radiation and warm faster than lighter coloured animals. Crypticity ties in with eating or being eaten. Animals that are highly cryptic can avoid predation or conceal themselves from prey until they are in striking range. Signaling is almost the opposite of crypticity. Animals use bright colours to positively communicate social status to conspecifics; males can signal to other males to avoid fights and increase fitness and males and females can signal to one another and sexual selection can result. The apparent evolutionary contradiction between crypticity and signaling colours has been resolved in anumber of different ways in different ways such that many lizards can be both cryptic and still signal conspecifics and has been of interest to evolutionary biologists for many years. The two dissertation projects revolving around lizard colour in Madagascar for this coming summer focus on two very different groups of lizards, chameleons and nocturnal leaf-tailed geckos, that have very different approaches to the evolutionary trade-offs associated with crypticity and signaling. In both projects objective quantification of colour will be established using a field-based Ocean Optics Jaz spectrometer. This spectrometer measures the spectral reflectance from all visible wavelengths from small individual patches of skin using a standardized light source. Spectra produced can be compared to one another from different tissue colours or the spectra can be measured as colour change is occurring. The first dissertation project involves colour variability of chameleons. Popular literature would suggest that colour and colour change in chameleons is all about background and crypticity. Studies on how chameleons are using colour have not born this notion out. The sudden and spectacular colour changes that chameleons undergo are almost always about social interactions and signaling. Chameleons can alternate between a subdued and an excited colour pattern very rapidly. In the subdued pattern that is typically exhibited the colours and patterns seen may involve bright colours but is generally quite cryptic in foliage. The excited colour pattern however is decidedly noncryptic. Some of these colours and patterns are among the most spectacular colours and patterns found in any vertebrate. In many chameleons males can trigger a colour change in other males and males can trigger a colour change in nonreceptive females (typically gravid). 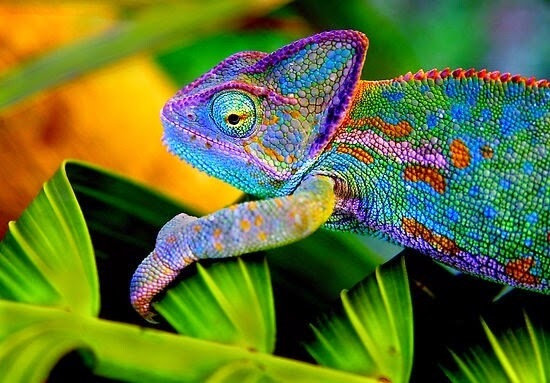 Some chameleon species and sometimes populations within species can vary in their ability to change colour and the colours that are found within different genders or ages of lizards. dges” that are likely involved in social signaling. Very little is know about the extent of colour change ability of either males or females. Quantification of the spectral profiles associated with these colours and colour change will be compared to that of other chameleons. In addition this data will be used to test a colourchange model based on cell type and arrangement in the Panther chameleon. that lizards are present in sufficient number for both of these projects and that the Jaz spectrophotometer can be used to objectively quantify the colours and colour changes that are occurring. Eureka Sparks is always interested in bringing new contributors into our community. If you’re interested in blogging with us, please fill out our application, and we’ll be in touch. © 2010-2018 Eureka Sparks All Rights Reserved.